So this month I reach a pretty big milestone: I turn 30! I’m still having some trouble grasping what that all entails, and although I’m on the precipice, I haven’t gone over the edge yet in over thinking where I expected to be at this stage in my life versus where I’m am (I figure that’s what we all do when we turn 30, right? RIGHT?!). But I figure there’s plenty of time in life to worry about that! I do, however, want to take advantage of me getting old and do something useful with it, so I’ve decided to try and raise some money for Haiti Scholarships. My goal: get thirty (30) donations for Haiti Scholarships throughout the month of February. This effectively means that my birthday becomes a month-long celebration! I want to be clear here: I’m not asking for 30 donations of $30 (although if that’s your desire, by all means! ), but simply 30 individual donations of any size. Yep, even $1.00 counts. What will your donations be used for? This school year (2012/2013), we have helped 27 students in Haiti enroll in school, and pay for their tuition. Our goal is to at least keep these 27 students enrolled in the 2013-2014 school year, and hopefully with larger scholarships. This means raising over $8,100 between now and September. Thanks to our monthly donors and a generous fundraiser from Grace United Methodist Church in Oelwein, Iowa, we’re off to a good start with current funding for the 2013-2014 school year at $2,200.00. Ideally we’d like to increase the number of students we help each year (especially since we get applications from students all the time, that unfortunately we have to decline due to lack of available funding). Ready to make my birthday challenge a non-challenge? Just click here, then click on the PayPal link. We have a couple different donation options: you can sign up to be a monthly sponsor, or make a one time donation. 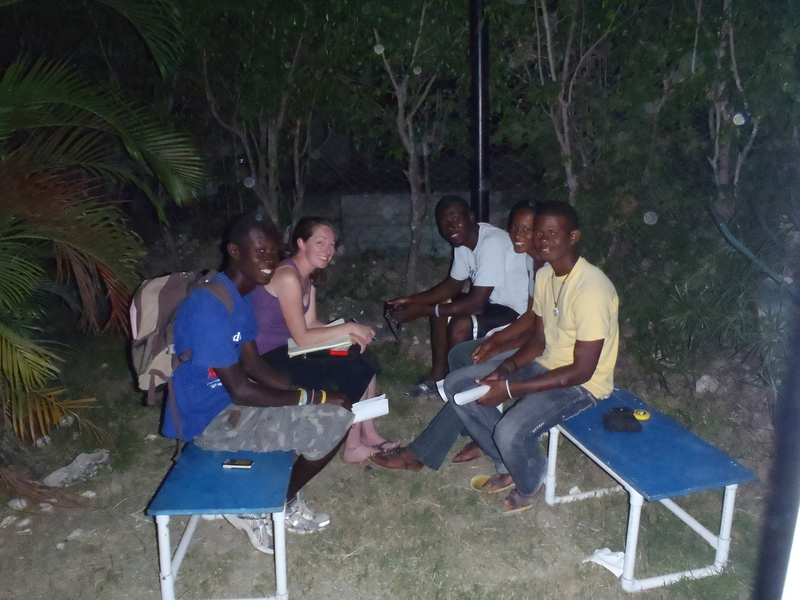 Meeting with students in Haiti in March, 2011. 2/3/13 Update: Four donors so far and $100 raised. 2/10/13 Update: Seven donors and $170 raised. 2/11/13 Update: ten donors and $310 raised. 2/12/13 Update: sixteen donors and $435 raised. 2/19/13 Update: seventeen donors and $465 raised! 2/27/13 Update: THIRTY DONORS!! and $765 raised!! !